Puppy training is an essential part of any pooch's growing years. Teaching your puppy to obey your orders is no doubt painstaking, but if you don’t train your puppy now, sooner or later he will drive you around the way he likes. Being violent or too vocal at a puppy can make them more aggressive, and sometimes slow in learning. 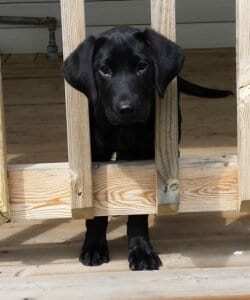 Labrador Retriever is a very intuitive breed, and they can sense when you are stressed or frustrated. Instead of shouting at them, be firm and assertive in your command. There is nothing wrong is showing them a stick, but certainly do not hit them. Indulge in short activities where the puppy can be attentive for the maximum time. Activities should be simple to encourage the puppy. ‘find the toy’. Give simple and direct orders, preferably use one word only - “Wait”, “Sit”, “Fetch” to ensure he understands. Fix time for food, bed and training. Slowly, your pooch will start getting to used to it and stick by the routine. Be clear and consistent on the do’s and don’ts: e.g. : telling “no” to your lab from coming on the sofa. This is particularly an essential part of any house training. Retrievers are full of energy. They need to be walked thoroughly. The more active you make them, the less destructive they become. This way it will be easier to house train them - sleeping in the crate, walking out in the garden to release, and getting familiar with people and surroundings. Reward based training so that your puppy performs the desired behavior. It can be in form of a verbal praise or a dog treat, to help reinforce good behavior in them. Try clicker training, making a clicking sound for a specific correct behavior, where you immediately correct your dog or mark an event. If your lab is successful in performing the trick you want him to do, then use a clicker and reward your dog too. For instance, to make your dog ‘sit’ on command. First, wait for him to sit on his own. Click and treat. Repeat this several times. Give the command ‘sit’, if he obeys, again click and treat. Repeat several times. Your Labrador Retriever puppy will be happy to please you, and surprise you with tricks if you are gentle, rewarding, and patient. For more information about Labrador Retriever Puppy Training and Dog Daycare Edmonton Please visit : Club Mead Pet Resort.